Our IOT Tests allow you to experience an online examination in the real-time environment. In every online test on IOT, you will be presented with Multiple Choice Questions (MCQs) which will test your skills in IOT Concepts in a detailed and comprehensive manner. In the test, each question will have 4 options to choose from. You should select only 1 correct option as an answer and then move on to the next question. Once you submit answers to all the questions, you will be given your final test score. In the Online IOT Test, for every correct answer, you will be given 2 points. There will also be negative marking of -1 for every wrong answer. So, you will have to be more careful in choosing the answers to the question in your online examination. If needed, you should skip to the next question and come back to the previous question later so that you can do proper time management for the online mock tests. 1. "IOT Practice Tests" - In IOT practice tests, there will be a series of practice tests wherein you can test your IOT concepts on every chapter separately. There will not be any time limit on these tests. So, IOT Practice Tests should be the first set of tests which you should attempt. Goto these practice tests here. 2. "IOT Mock Tests" - In IOT mock tests, there will be a series of mock tests wherein you can test your IOT concepts on every chapter separately, but there will be a fixed time limit per test. So, it is similar to IOT Practice Tests, but with an added constraint of time limits. 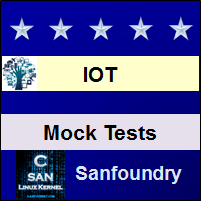 You should try IOT Mock Tests if you are appearing for any online examination soon. Goto these mock tests here. 3. 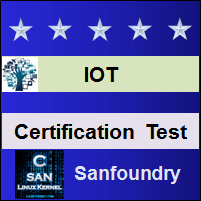 "IOT Certification Test" - Once you are through with your IOT concepts, then you should try our IOT Certification Test wherein Sanfoundry will issue a free Certificate to you if you scored either Grade A* or Grade A in IOT Certification Test. Goto IOT Certification test here. 4. 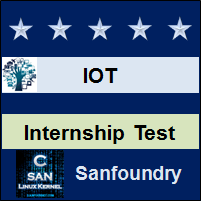 "IOT Internship Test" - If you are interested to do Internships in IOT at Sanfoundry, then you must take our IOT Internship Test. If you scored either Grade A* or Grade A in IOT Internship Test, then you are eligible for Internship at Sanfoundry in IOT. Goto IOT Internship test here. 5. 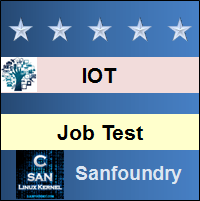 "IOT Job Test" - If you are a fresher, a dropout, an experienced person and if you know IOT well and looking out for jobs in IOT domain at Sanfoundry (or our Network of Companies), then you should try and qualify our "IOT Job Test". 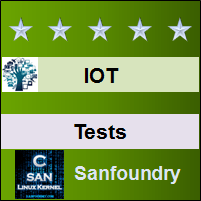 If you scored either Grade A* or Grade A in IOT Job Test, then you are eligible for a Job at Sanfoundry (or our Network) in IOT domain. Goto IOT Job test here. For every "IOT Practice Test", Total Questions: 20, Total Time: Unlimited. For every "IOT Mock Test", Total Questions: 20, Total Time: 20 Minutes. For "IOT Certification Test", Total Questions: 50, Total Time: 1 hour. For "IOT Internship Test", Total Questions: 50, Total Time: 1 hour. For "IOT Job Test", Total Questions: 50, Total Time: 1 hour. Before you get started on these series of online tests on IOT, you should learn, study and practice our collection of 1000 MCQs (Multiple Choice Questions and Answers) on IOT here. We also prefer that you should practice IOT practice tests and mock tests completely before attempting the certification test. Here is the list of online practice tests and mock tests on IOT. Each online test focuses on a "Specific chapter of IOT". So, you should try both practice test and mock test on every chapter to do a self-assessment of your knowledge (along with time-limit constraints) in every area or sub-topic of IOT. IOT Certification test, Internship test, and Job Test are mentioned at the end of this list. 1. IOT Test 1 – This set of online test on “IOT” tests your skills on Open IoT Architecture, SOA Based Architecture, API Based Architecture, IoT Architecture for Smartgrid, IoT Architecture for Precision Agriculture, IoT Architecture for Smartcities, Galileo Gen 2 Board. 2. IOT Test 2 – This set of online test on “IOT” tests your skills on LPC 2148 Pro Development Board, Microcontroller (8051), Microcontroller (8051- Pin, Registers, Timers), Microcontroller (ARM 7), Microcontroller (ARM 7- Pipelining), Arduino. 3. IOT Test 3 – This set of online test on “IOT” tests your skills on Rasberry Pi, Eclipse software – 1, Eclipse software – 2, Kiel IDE, IoT Devices, Pressure Sensor, Accelerometer and Gyroscope Sensor, Temperature Sensor. 4. IOT Test 4 – This set of online test on “IOT” tests your skills on Humidity Sensor, Proximity Sensor, Touch Sensor, Analog to Digital Converter, UART Protocol, USART Protocol. 5. IOT Test 5 – This set of online test on “IOT” tests your skills on I2C Protocol, SPI Protocol, CoAP Protocol, MQTT Protocol, HTTP Protocol, XMPP Protocol, Network Layer. 6. IOT Test 6 – This set of online test on “IOT” tests your skills on Transport Layer, Application Layer, IP Address, MAC Address, IOT Gateway, IOT Gateway ( Edge System), IOT Gateway( Wind Intelligent Device), Understanding the Relationship between IoT and Big Data, Understanding the Intel IoT Analytics Structure, Setting up Devices in Intel IoT Analytics. 7. IOT Test 7 – This set of online test on “IOT” tests your skills on Collecting Sensor Data, Analysing Sensor Data, USB Bootloader, Bootstrapping, FOG Computing, Application of Fog Computing, Publishing Data to the Cloud with Dweepy, Building a Web- based Dashboard, Sending and Receiving Data in Real Time Through Internet. 8. IOT Test 8 – This set of online test on “IOT” tests your skills on Publishing Messages with Commands, Publishing Messages to the Cloud, Cloud – Powerful Smart Mobile Devices, Cloud – Runtime Adaption Engine, Cloud – Privacy Protection Solution, Communication with IOT Devices with Voice Commands, Communication with IOT Devices with Thoughts. 9. IOT Test 9 – This set of online test on “IOT” tests your skills on Communication with IOT Devices with Smart Phones, Scheduling Process and IOT Services Lifecycle, Resource Management, Handling Actuator Request, Handling Sensor Request, Multithreading, Designing for Emerging Technology. 10. IOT Test 10 – This set of online test on “IOT” tests your skills on Taking Control of Gesture Interactions, Designing Material Behavior, Collaborative Robotics, Neuroscience and Cosmology, Toy Designs, IoT Characteristics and Reliability Issues, Addressing Reliability. 11. IOT Certification Test - This set of online free certification test on "IOT" tests your skills on all areas (all chapters, topics and subtopics) of IOT. 12. IOT Internship Test - If you scored either Grade A* or Grade A in our IOT Internship Test, then you can apply for Internship at Sanfoundry in IOT. 13. 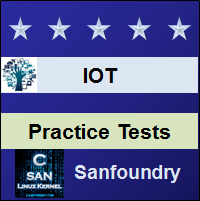 IOT Job Test - If you scored either Grade A* or Grade A in our IOT Job Test, then you can apply for Jobs at Sanfoundry in IOT domain. Best Wishes for your IOT Tests!